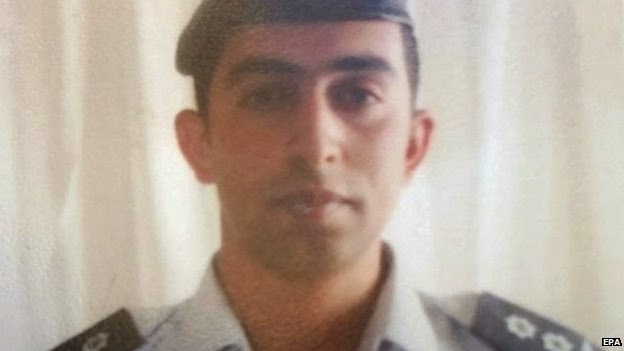 Jordan has confirmed the death of Lt Moaz al-Kasasbeh after an ISIL video showed the terrorist organization has burned him alive. The footage shows a man in a cage and engulfed in flames. Jordan vowed punishment and revenge, and Jordan’s King Abdullah on a visit to Washington is cutting his trip short to return to Amman. Lt Kasasbeh was 26 and had been held hostage since his plane came down on 24 December. Such animals these ISIS people are... I hope the Jordanian Air Force bomb the hell out of them. They owe it to the young pilot who has been killed so brutally after surviving a shut down...they have to revenge! It is such a sad event! I have never in my years heard of any prisoner of war treated in such a savage way. Evil deeds and acts do unfortunately occur and are commited against captured combatants in every armed conflict, but this must be the worst ever. No matter what type of mission(s) Mr Kasasbeh was performing against IS, he had been captured and was thus a prisoner of war and should have been treated according to the rules laid out by the Geneva convention. Instead he was murdered in the most cruel fashion. He died as a martyr in the struggle against Islamic extremism. All honorable people should mourn the loss of this man as well as strongly condemn IS. May he rest in peace. Wow Uskowi,why didn't you allow my previous post through? Is it because I used the word "islamist"? Lets face it,Shia or Sunni Islamists are all the same.They feed off the same book and allow themselves to became monsters against humanity.Good example how the occupiers in Iran have been forcing themselves on us for the past 36 years.They are all savages period. Thank you sir for your thoughtful message. May Lt Kasasbeh's memories live forever! ISIL is a disgrace for the Islamic world and the whole civilization.